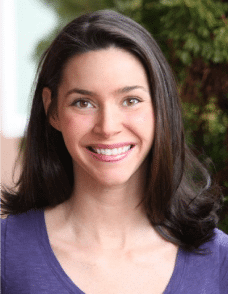 Heather Dessinger 226 Comments This post contains affiliate links. So, the other day my husband stopped by Whole Foods after picking up produce, meat and cheese from our local farmers market. The cashier took one look at our reusable bags and, um, insisted on giving us new ones. 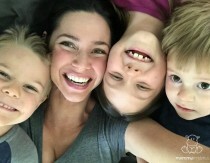 Apparently, they don’t like the look of them after they’ve been repeatedly dragged along the ground by children who “help” unload the groceries. Anyway, I’ve been looking for an easy-to-carry, washable alternative for the kids to use, and over the weekend I came across the perfect solution. My local thrift shop was selling cute t-shirts for 99 cents apiece that were practically begging to be upcycled into a farmer’s market tote. They’re 100% washable, and when they’re no longer useful as bags I can cut them into rags to clean with. There was just one problem: I can’t sew. At all. Fortunately, I came across some no-sew ideas that Katie and I adapted to fit our style (which, if you’re curious, generally favors the color red and anything Snoopy). The took no more than 10 minutes from start to finish, and I love how they turned out. If you’d like to fold the t-shirt in half you can cut both sleeves at once so that they are identical. Or, if your material is too thick to cut them both at once, you can cut one, then fold it in half and use the cut side as a guide for the next sleeve. If you’d like, you can turn the shirt inside out and trace the outline of a bowl before cutting. I used both methods and personally, I like free-hand cutting better because I prefer a slightly oval shape to a perfectly round one. I ended up trimming this one a bit to make it more oval. If you haven’t already turned your t-shirt inside out, do it now. Determine where you want the bottom of the bag to be and trace a line across. Keep in mind that depending on the fabric used, your tote is likely stretch and become longer when it’s filled with stuff. 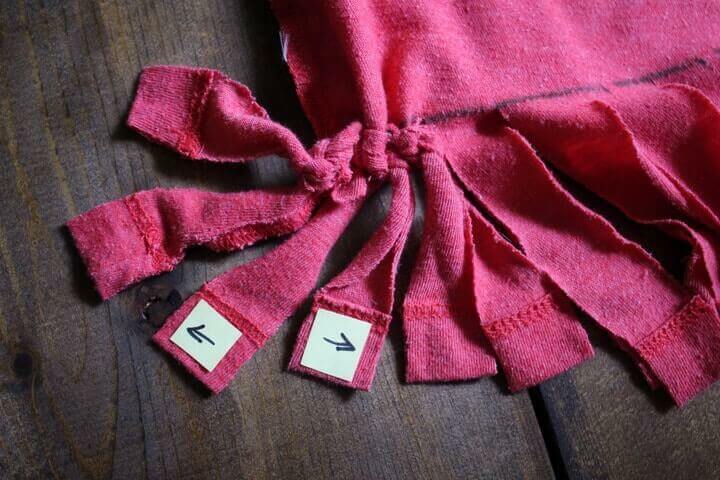 Now grab your scissors and cut slits from the bottom of the shirt up to the line marking the bottom of your bag. You’ll want to cut both the front and back layers together because they need to match up for the next step. I cut my slits about 3/4 to 1 inch apart. Okay, this is going to sound really complicated, but it’s NOT, promise. Take your first pair of fringe and tie it into a knot, then tie two more pairs. Now if you lift your bag you’ll see that although the pairs are pulling the bag together, there’s a hole between each pair. This next step will close those holes. In the photo above you see three sets of fringe that have been tied in knots. What I do next is grab one strand from the middle set (the one with the arrow pointing left) and tie it in a knot with one of the strands on the left set. Then I take the other strand from the middle set (the one with the arrow pointing right) and tie it in a knot with one of the strands on the right set. Then I take the remaining strand on the right set and tie it to the next set of strands, and so on and so forth until all the strands are tied. Now turn your t-shirt right side out again and voila, you’re done! A Couple Of Fun Variations . . . Turn the bag right side out when tying the fringe. This is one I made for Katiepotamus. So cute!! Definitely going to try this… now for a trip to the thrift store 😉 Thanks for the simple tutorial! Hi,I’m Megan. I was hoping that you could try explaining the last step. It really is confusing and I would love to have the same bag! I make lots of these and don’t do the cross knotting shown here. I simply knot each pair. Because my fringes are only about 1/2″ each, the space between them is very small. Unless I’m carrying a bag of shelled peas, nothing’s going to fall out! Thank you! That makes it much easier! I know the goal is not to sew but how about just running a line of sewing across the bottom on the wrong side and not have to do all those knots? I agree because it would make the bag less lumpy on the bottom. I would see it several times across to make it stronger. She tied three pairs first, she tied one piece from the first pair with one piece from the middle pair. Thank-you for that clarification! I too was a little confused. I have done with an other way too…no fringe !! I kept the piece I cut at the bottom which formed the hem of the t/shirt. Turn your back inside out and gather the bottom in your hand. Tie firmly ( twice ) with the cut piece you have put aside and make sure the knot is really secured. Turn your bag on the right side again , and….voila !!! I turned my bag in side out and sewed two rows of zig zag stitches. No fringe. I do that too and it is so much quicker and easier! I want to tryy. So brilliant!! Does anybody think this would be sturdy enough for a school bag? And if not what could I do to reinforce it a bit? Just make sure it is a thick cotton shirt, not thin material and also…depending on how much you carry…the shirt may need to be an XL to an XXL…. Use two t-shirts, one inside the other. I was thinking about doing the same. I’m not a big on sewing, but I think I would like the inner one seen across bottom with putter one fringed. I have a TON of Æ shirts, roots, Hilfiger…Ones that we no longer wear. What an awesome idea! ‘To reinforce t shirt material u can make the inside sturdier by turning bag inside out then get a roll of duct (silverygrey )tape.then cut strips and lay horizontally starting from bottom.flip over and repeat .insert a book,tray or piece of wood for ease and as a guide to strech to desired size.Good luck! Try the double t-shirt – really strong. ? Then you don’t need to use “plastic” duct tape ?‍♀️ & recycle two t-shirts ?? I was just thinking that I could take one of my son’s favorite shirts that he has outgrown and make a library bag so he can continue to use his favorite shirt. You could make 2 t-shirts up,keep 1 the right way and one inside out , put the inside out 1 inside the other, line up handles , so that if you then turn bag inside out it wont have a wrong side (makes it reversable and strong enough for most school stuff) hope this is helpful, just one thing make sure the t-shirts are same style. If ones got one of those small pockets it could be useful on the inside. I have re written this about three times to make it as easy as possible to understand. Good luck. I’m sorry … This would work so much better sewn. ? Buy for *Total” npn-sewers, it’s easy to do. Sewn was best, even by hand with small stitches. Great for boys T-shirts for car toys organizer or to hang bath toys up on a hook to dry. So many uses for boys to use. Totally agree! Also if you didn’t want the stretch then use a fusable interfacing to stablize it. There are lots of people out there that would be happy to show you how to sew. Check churchs, sewing or quilting shops, ect… The main thing is get the word out you want to learn because someone will know someone that can teach you. Then get the word out that you want an old simple machine to learn on. Someone will find you one for about $50.00 or if your really lucky free. Start learning on old clothes you know longer want and remember no one is good at any new skill they try. It takes years of learning to get really good but have fun along the way and be happy with where you are. Craftsy has some really good classes at all levels in lots of hobby interest. They even have some free classes. I love taking there classes. My grandaughter and me take several of there classes. We have lots of fun learning. In fact we just swiched up to craftsy unlimited so we pay a mothly fee and can watch everything we want too. Just a thought? I can sew, but I don’t have access to enough machines for an entire VBS group, so this will make a great craft and they can keep their materials in it for the week! thanks so much! The whole point of this is that you don’t have to sew. 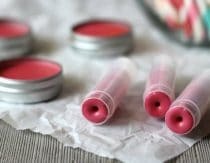 It’s a great DIY gift and something you can do with the kids for gifts. If you want to sew a bag, then look for sites with instructions for sewing bags. I have one question. If you have a hot glue gun (like I do) could you use that method instead of the knots? Amazing idea! Depends what you are using it for. I use mine for a pet sling so I would not use hot glue. I tied mine like the tutorial. If you are using it for something lightweight, and wouldn’t care if something fell through then I would try it. Glue gun glue could freeze or melt. Easily comes undone when washed …. Don’t give up. I plan to make several more. Stitch Witchery is also known as Interfacing (Pellon is a common brand name). When ironed to both inside “walls,” it would provide the stability and anti-stretch that others were seeking. I made the cutest puppy sling out of my t shirt. She really, really, likes it. I tied it at the bottom like you did. I put a puppy pad in the bottom because she is only six weeks old. These make perfect reusable cloth grocery bags! Plastic grocery bags are detrimental to our beautiful planet! They have even been outlawed in some countries. Yes where I live u get charged 5 cents per plastic bag. Which isn’t that much but it’s bad for the environment (the bags obvi lol) I sewed my own but had to do it by hand bc my sewing machine broke. It took FOREVER so I def dig this tying way! Plus it seems like it would be stronger than my sewn one. Super cute! Love the fact that you used the front of the shirt as a bit of personalization. I foresee a few of these in my future. Great job! Thanks! I have been looking for a no sew version of this idea. Woot! I know what we will be using at the library next week. Excellent! I too do not sew. I have made fleece no sew blankets so this up my alley! Thanks for the share! I can’t sew to save my life despite a family of professional seamstresses. Can’t wait to try this. On a side note. My Hubby came back from the butcher today giddy as a school boy. He had a bag of beef kidney suet with the kidneys still attached. I laughed. This from a former coca cola addict. I thought of you. Tongue is delicious! Moist and very tender. Scrub it under running water, put in the big slow cooker, cover with water. Add salt, garlic, an onion, some bay leaves, peppercorns, juniper berries if you have them, do on high for 2 hours, then on low for 5. Remove from heat, let cool a little, peel the outer skin off, your pets will love the skin. Slice, great on sandwiches or served with a raisin, mustard or horseradish sauce. Love tongue!! I make it like a stew, slow cooking… divine!! When I was a kid at a family gathering, there was a tongue on a plate with some parsley, the parsley didn’t help me from convulsive dry heaves. It was the most disgusting thing I had ever seen on a plate before. That it was on a plate, was an indication of intent for eating. Then someone said it was time to slice it, when I saw the knife sliding through the immense tongue, I knew I had to leave the table at once. This caused quite a stir which made me move faster faster than I thought possible. P.S. 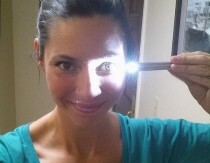 Love this idea & your tutorial is so easy to follow! Thanks for sharing!! Love it! I need to make some grocery bags. Most of mine are wearing out, too. I much prefer my fabric ones that I can throw in the wash, over the reusable ones you get for a dollar or two. I’d sew the bottom with a machine, but for those who don’t have one, this is awesome! Quick question…did you make the round rug? If so, is it made from t-shirts? I’ve seen some similar, and I just love it! I’m insanely curious about the rug as well & would shout Woo Hoo if it was made from T-shirts & there was a tutorial!!! Love that rug!! My daughter (13) saw this post this afternoon and has spent the rest of the day going through her old t-shirts (and mine!) and making these bags. We now have several really cute shopping bags! Adorable idea! I think these will be stocking stuffers for my 14 grandkids this year. Love this! My husband is always bringing me home event t-shirts that I’ll never wear (aside from pajamas) but wouldn’t mind using them as a shopping bag. I can totally see using concert or festival t-shirts for this! Thanks! Great stuff! If only I would remember to take the bags out of my car instead of filling my purse! Thank you! My girls just got finished making this. So cute and very simple! Yay! I love thrift store shopping. Such a cute idea! I love the rug in the background too! 😉 Would you mind sharing where that came from? LOVE your projects……you are like my new best friend. THANKS!!!!! Where did you buy the your beautiful round braided wool rug in the last picture? Please tell me! This is so cool! I have been wanting to do something like this for a while but didn’t know how to go a bout it. Thanks for the awesome tutorial! Our Girl’s Empowerment Program has recently opened a Thrift Store here on Guam and we have so many t-shirts we are selling them for 4 for $1….. I’d love to have the girls make these bag as a fundraiser for our arts & crafts programs. Its a great idea! I made it with my three kids and they love it! They decided to decorate it with ribbons made with the sleeve remains. Also, we put beads with hot silicone. Anything new sew is right up my alley. Love this idea! 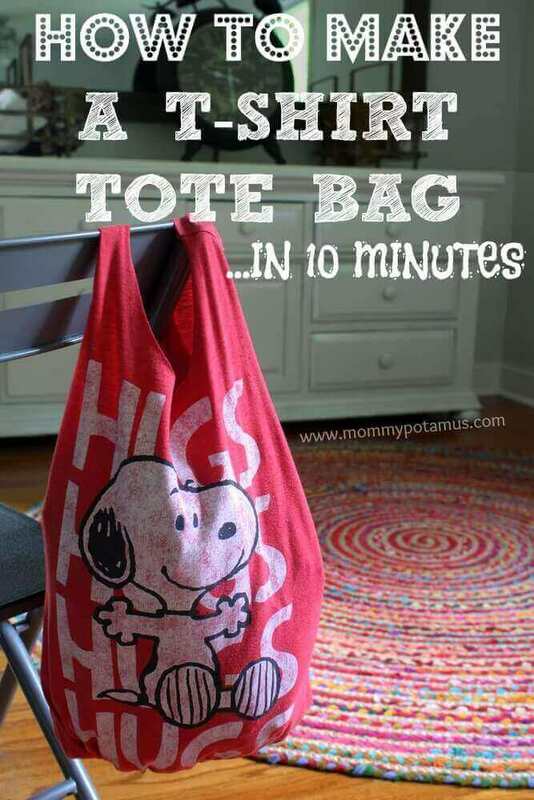 Great way for bags for grocery store. Here where I shop at Krogers I get 5 cents back for each bag we bring in to carry out our grocerys. Win win. Give as gifts that way to friends without it being expensive but thoughtful. Get read for any gift giving time. I just made this and it is darling. The,t-shirt was an extra large and took me a lot longer than 10 minutes, but it turned out and my husband didnt believe I made it without sewing! Thank you. I love this idea! I think I’ll make a bunch of these but just sew a super quick stitch across the bottom instead of tying. 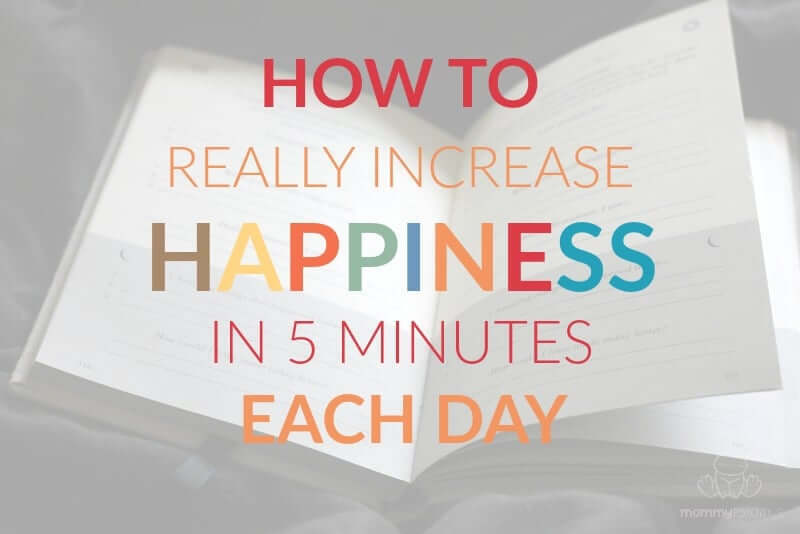 It would seriously only take 4 minutes so it’s perfect! I need to try that, looks so cool and easy! Very interesting. Going to make for my grandchildren. On the red and white striped bag you show, where’s the fringe? 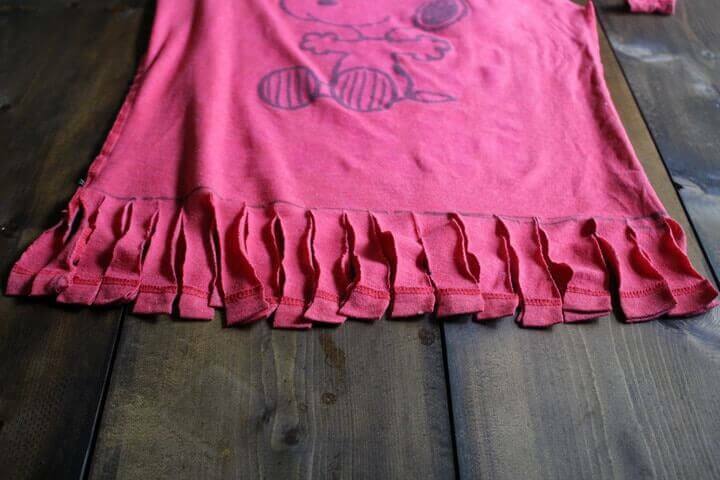 In the Snoopy shirt example the fringe hangs down. In the striped shirt example it’s not there. Help! I prefer no fringe but I cannot sew either! Pam, when the fringe is not visible it’s because it’s inside the bag. When I made the Snoopy bag I turned it inside out, tied the fringe, and then turned it right side out again. Omg! That’s such a simple answer I literally smacked my head as soon as I read it. Duh!!! Lol! I love this idea, I think it’s great.. but PLEASE, PLEASE, PLEASE do NOT go out and buy shirts from thrift stores (or bargain stores) specifically for the purpose of cutting them up to make bags. PLEASE use ones you already have at home. Some people have to rely on thrift stores for their every day wear because they cannot afford to buy brand-new clothes and every shirt that someone buys from a thrift store (same goes for the cheap shirts from Target) to make a bag means a shirt that someone who actually needs a shirt to wear rather than a cute shopping bag goes without. Upcycling is great, but not at the expense of people who need access to inexpensive clothing. We’re such a wasteful society that I highly doubt someone would end up going without because people buy a few t-shirts at a thrift store. In our thrift stores, they put many, many t-shirt in boxes for rags! Or they could just make sure to bring there next clothing donation to the thrift store to benefit others! Thrift stores DO NEED lots of types of customers, not just the people who “have to” shop there because they can’t afford anything else. So easy and really neat. Will be doing this with my grandchildren. Great project for just about any group to do. if you cut the shirt while it’s wet, then throw it in the dryer, the cut parts will roll under for a more “finished” look! Will it have the same effect if you make the whole bag first then wash it/dry it? What size tshirt did you use? Do you have any idea what size tshirt makes what size bag? Thanks! Hi Kari, it really depends on how deep you cut the strands at the bottom. That’s how you determine how tall the bag will be. Whatever the width of the shirt is will be the width of the bag. I’m wondering about the top when you’ve cut off the sleeves/collar… without hemming the fabric there does it curl/get messy/unravel at all? It seems a lot easier than the sewing versions, but that’s the difference I’m most curious about. Thanks for a no-sew option!! 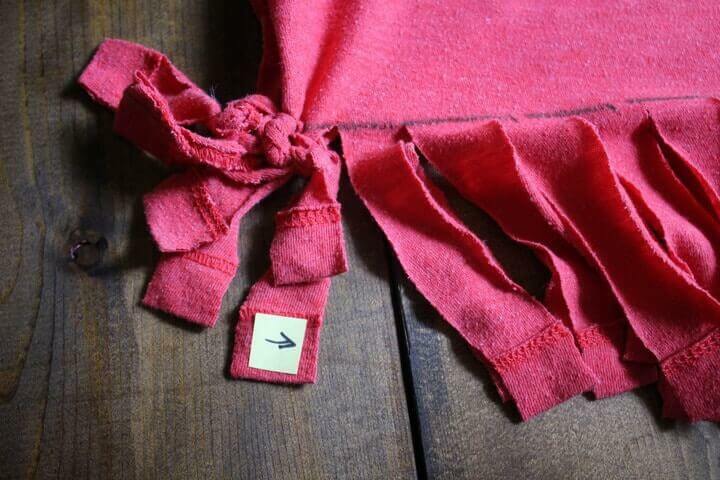 The sleeves can be cut right at the seam, so the seam remains on the bag. The other side rolls slightly, but doesn’t unravel. I’ve made many of these. I sew them, though and “square” off the bottom. I LOVE THIS IDEA. I collect tote bags, but sometimes they are kind of heavy. 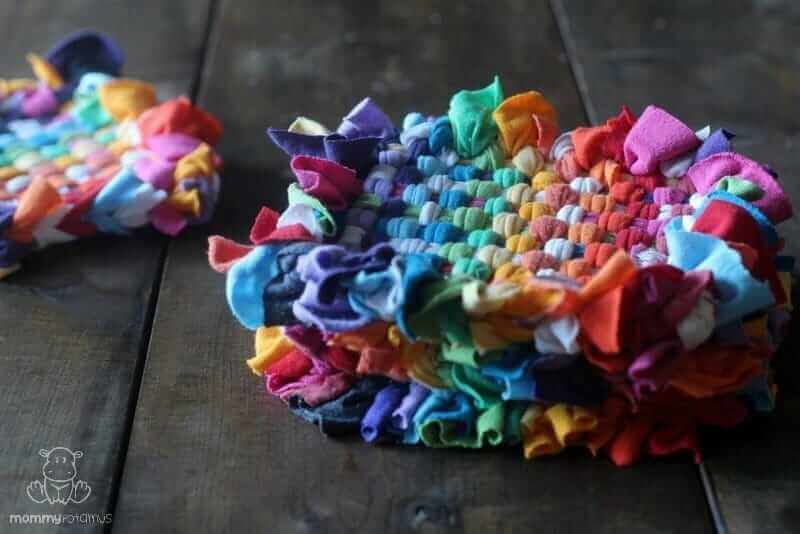 These will be great, I love that they are washable and they take up almost no room to store, when not in use. Thanks for sharing this idea!!! This idea is really cute and fun!! I love taking my re-usable bags to the store and it is even more rewarding when some of the stores give back a bag credit for bringing in our own bags. 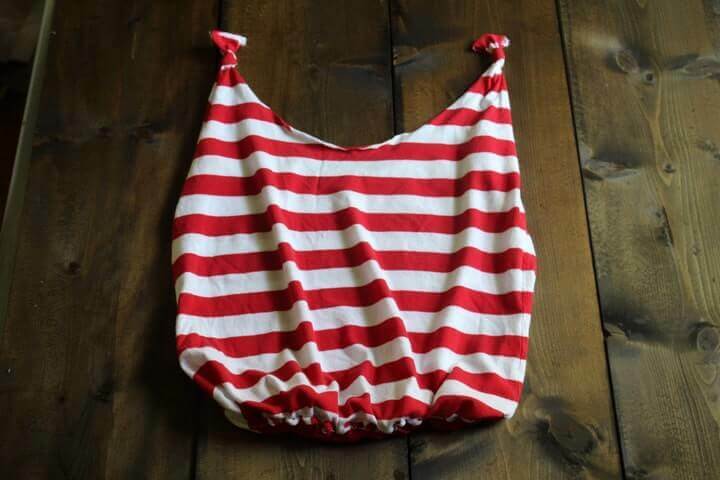 I can’t wait to make one to use and find a cute top at the thrift store to up-cycle it as a bag. This post reminds me of how I made my No Sew DIY T-Shirt Infinity Scarf out of a top. Thank you for sharing this idea. It’s brilliant! Thanks for this project! I had 2 old teeshirts from The Common Ground Country Fair in Maine and loved the graphics but the fit and material weren’t good for wearing. I didn’t want to throw them out so now they are shopping bags! Yay! I’m so glad you were able to repurpose them. 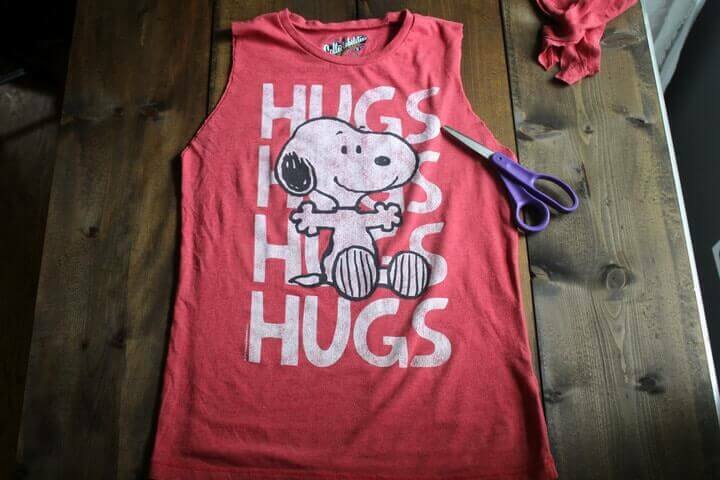 Great idea, but: there are so many sleeveless t-shirts, would these not work better and allow less cutting? And why would we want to cut the neckline off when they are usually already seamed? We could just fringe the bottoms and tie or us with sewing machines just turn the tees wrong side out and stitch, and we are ready to go when the tee is turned right side out? Doesn’t the fabric stretch hugely when you are carrying groceries in your bags (since knit fabrics do tend to stretch a lot)? It depends on how tightly woven the cotton is – some t-shirts stretch more than others. No need to limit this idea to grocery bags. They make a great gym bag, as they will hold everything, change of clothes to gym shoes. At the end of the day, throw all the stinky into the wash, including the bag!! Also great for Famer’s Market days. They will get dirty, throw them in the wash! Take one along on your picnics, just toss all the dirty containers in the bag! The possibilities are endless!! I have ben using them for years. Enjoy!! Love the idea – I don’t sew, and this is also a teachable craft for Girl Scouts of all ages, thank you for sharing! Thanks for directions. I would like to print the directions for No Sew Tshirt Bags, but don’t want all the extra ads, etc. Would you please email to me. Thank you. I love this! I do not sew and think this is great for all of us non-sewers! Thanks for sharing! BTW-great directions! Seems like this could be even sturdier if you used tank tops to start with as the opening and handles would be done for you and finished off on the edges as well. love your idea! I did similar for a project for kids. Had many fabric paints and because one of the celebrations was a 60th birthday party, theme being When I am old I shall wear purple, everybody was treated to a purple t-shirt and red ball cap. For the kids the next day I had the shirts ready for the to decorate with their own art. Then, I cut them out with the help of 2 aunts when they were dry and sewed the bottoms up. The kids loved their personalized bags and my goodness we had some budding artists in the group. Too cute! This is a cute idea. I will pin this so our kids can try it when they are learning to tie knots. I will try a ‘sew’ version because it will be faster. So, we will try out your idea two ways. I love the knotted strap variation. Very cute. Thanks for the inspiration! I just made one. I’m not very crafty, but this was easy enough. Thanks for the idea! Could also use the bottom hem for a draw string closing, using an old shoe string. I saw this on Pinterest last night and I just had to try it out. 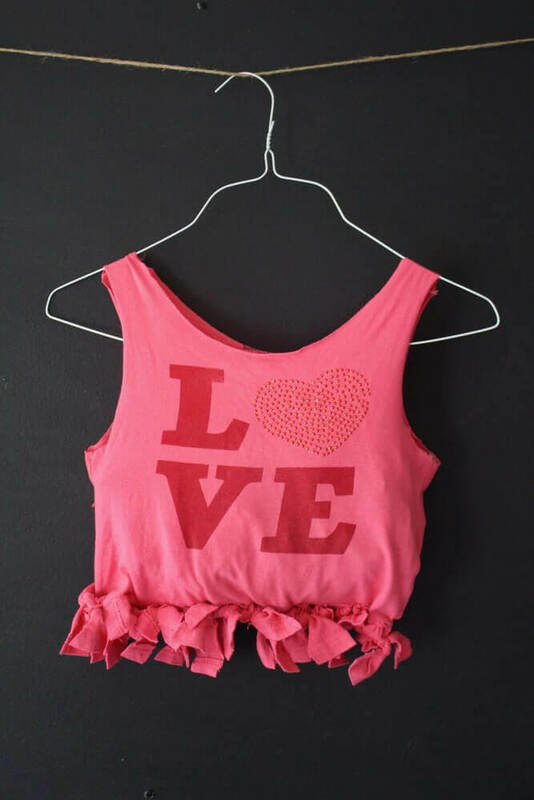 I have so many tops that don’t fit anymore, I love the idea of up-cycling them into something useful like this! The bottom of mine didn’t turn out as good as yours did but there weren’t any holes when I got done with it so I was happy with it. I’m not crafty at all but this came out so adorable. I can’t wait to try it on my favorite shrunken sweater next! Thank you so much for the easy tutorial. So glad you found it helpful, Whitney! These are wonderful! Such a cute idea for adorable shirts you don’t want to wear anymore (or at all; I love the graphics, but hate wearing tee shirts). I’m going to run this by my husband, and if he likes it we’ll soon have something like ten new bags – he doesn’t get rid of shirts he stops wearing, because there’s an emotional investment. #wink This is way better than a tee shirt quilt, that’s fun but doesn’t fit in with your decor in the least. I just made this and I really enjoyed it! Very easy and fun, thank you! I just tried this for the first time, and even though I read the instructions several times before I started, I still managed to mess it up. I drew the line where I wanted the bottom to be, and then cut it right then instead of cutting the fringe up to that point! AAARGH. So now I have a really short bag with really open sides. Lesson learned!!! That is the best idea ever! I made my own and it looks fantastic ( I must say)! We applaud your thriftiness, ingenuity and commitment to sustainability! I had a shirt that has been sitting in my bottom drawer for 6 years now. It said “Best Mom Ever~Mother’s Day 2009. Needless to say, it’s a bit outdated and too small. But I couldn’t dare throw away something my kids got me for Mother’s Day! It has now been brought back to life as the coolest bag ever! Thanks so much for helping us ‘no-sew folks’ repurpose some treasures! It’s a beautiful idea ! Such a good idea!! I am participating at our local Relay for Life Cancer Event and I will be making several of these totes from old Relay t-shirts that we have accumulated from past events. I know it will be a hit! Thanks so much! That is such a fantastic idea!! I tried it and my daughter loves her new bag thank you so much!! Hi, I love this idea! I’ve just done one. So easy. Is it ok to trim the fringes when you are finished or do you think they will fray and make it no good? I have the same question. i’m confused at this point. Hi, Thanks for the idea… loved it 🙂 and used the bag too. Like will make some. Got lots of t-shirt. My sewing machine recently broke, but i travel alot (I’m a teenager) so I’ve been looking for different travel bags and this is perfect. Great idea, thanks! supercool ! my green communities will do this DIY project with several kids on orphanage! smart decision to reduce plastic trash in FUN WAY!! I love this! cant wait to try it. I purchased many $5 Disney t-shirts from the clearance rack at Target right after a trip to Disney World. I was shocked at how cheap the shirts were compared to the park prices, so went a little overboard. I am glad to have a new purpose for the designs that I still love, even though I don’t want to wear the shirt anymore. Thanks for the tutorial! Love it! Thank you very much for this fantastic idea! I just finished making a t-shirt bag. Thank you for the pattern. ..was easy to understand and complete. Love the concept… Def worth a try. Back in 1989 I went to my first concert…Metallica. If you knew me now, you wouldn’t believe that. Just turned my concert t-shirt into a bag! It will be fun and easy…and a conversation starter for sure! Thanks for the idea! Love the bag but I REALLY like the round rug in the background! Did you make that also? Share? great step by step instructions. The only thing I did different was to cut the sleeves on the outside of the stitching this made the handles stronger and stayed in shape a little better. I have a 4X tank top I bought for $1 thinking a child could wear it for a night shirt. I collect items for Operation Christmas Child shoeboxes year round and thought I’d make the shirt into a tote for a child to carry their box home. A lot of people have bought fabric/reuseable bags for their boxes, I did too. But thought I could try making one of these from the VERY LARGE shirt. It is plain, solid color. Maybe I’ll embellish it with an iron on design first. I do not sew either so this is a good idea for me. I look forward to checking it out. What a beautiful project ! I will defininety try it at home. Great idea! And also it’s a good recycling example for my girls. We just made few bags and they are really proud of themselves. I just showed once and they did the rest. Molly even made a small bag from one of her baby t-shirts as a gift to her best friend. Thank you for sharing this inspiration! I am a total sewer, but no-sew projects like this are nice as well. Super excited to try this! I had a t-shirt with an awesome stamp on it that I really didn’t want to throw away but don’t fit into anymore that was on top of my chair waiting for something to be done to it and this was perfect. Done in 10 minutes and looks awesome, I’ll be using it very often now! Thanks Heather for this fun and easy project. Seen it on Pinterest last night and couldn’t stop thinking about it today. So I created a bag and it came out fairly good for my first time. I’m not really good at crafting but your ideas and instructions were easy and clear enough so I gave it a shot. Now I can’t want to make more. 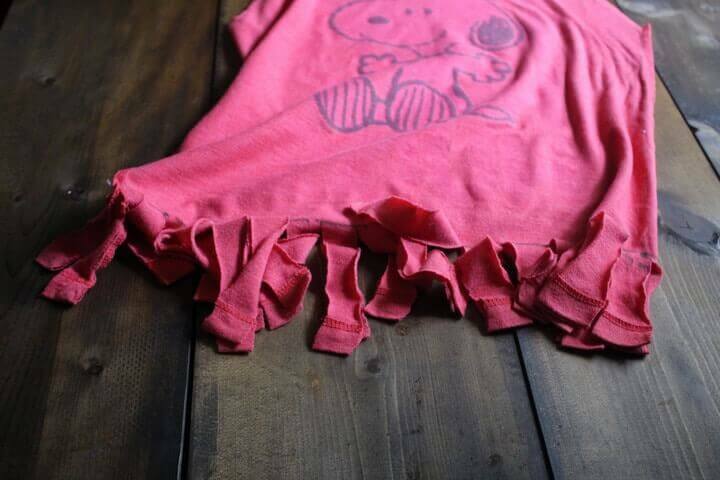 I have plenty of shirts I don’t wear anymore and this is perfect to reuse those old shirts!! Thanks again Heather!! Super cute AND you can make several and put them all in one of the bags… great for taking up zero car space and easy to take into the market!!?? You can use the cut off sleeves for pockets. It would require sewing. I love this idea. This may be a dumb and obvious question but on the 2 other variations of the bag there is no fringe so how were they done? If you turn it inside out before you tie the knots, the fringe will be on the inside and not be visible. THEY WERE TURNED INSIDE OUT SO WHEN COMPLETED, THE FRINGE WAS ON THE INSIDE. Your tutorial saved Christmas!! I bought a t-shirt that was too small without time to order the correct size. I wanted to turn it into a cute tote bag but don’t have a sewing machine and wouldn’t know how to use one if I did. A Google search led me to a few tutorials, and yours was the best. Easy to follow and didn’t need anything except the shirt and a pair of scissor. The bag turned out great. Thank you!!! SO happy to hear that! Merry Christmas! I love this and will try this with my wives club! Did you tie all the fringe sets in knots first before tying them to the adjoining sets? It is easier if you do. It is easier to keep track of In my opinion. could i cut the neck in a bit more to make the straps of the bag longer? I am a Speech-Language Pathologist and I have been looking for bags to place manipulatives along with their companion book in. THANK YOU, THANK YOU, THANK YOU!!!!!! My busy school life just got a little less stressful. Awesome idea! My teens accuse me of being a hoarder. I hate throwing away great stuff esp clothes that have hardly been worn. Thanks for sharing. I will be re-purposing some “old” tees. Any ideas for barely worn jeans? I think I saw how they were making purses out of jeans. I saw it on Pintrest. Good luck to you. I love this creativities. …. And i would to see more ….??? I am making one of these out of last years shirt for ending Alzheimer’s. We are getting ready to have a big walk and fundraiser locally. I thought it would be fun to share with others and I know they will want to know how to make one. Would you give me permission to print these directions, make copies, and give them to anyone who is interested. Thanks in advance. 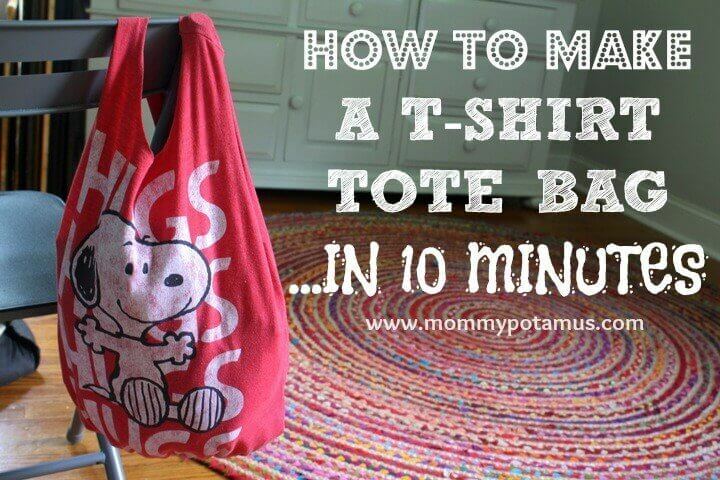 This is a genius way to make a personalized tote bag! I have a lot of shirts that I don’t want to throw away that could easily be turned into something useful like this! I also love that it doesn’t require any sewing. I’ll give this a try for sure. I saved this pin a while ago but decided to finally try it today with an old souvenir t-shirt I couldn’t part with but that was past its prime. It turned out great. 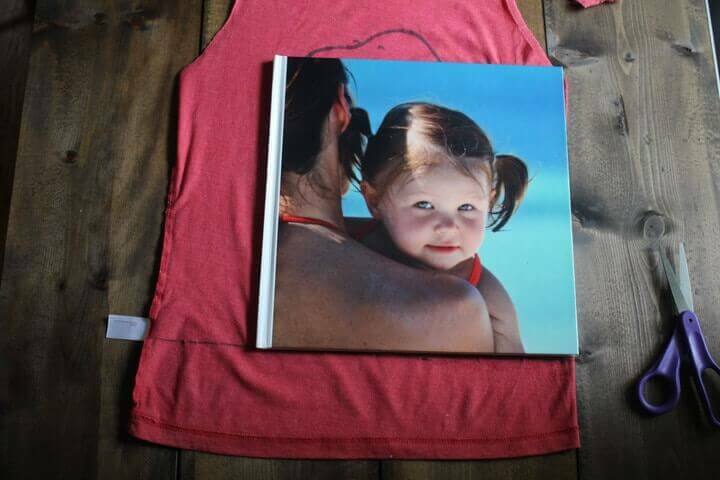 What an awesome way to recycle and give new life and purpose to fun t-shirts! I appreciate your idea for tying the second set of knots to make the bottom more secure. Terrific idea! Lots of people asked about making rugs. I made my first T-shirt rug when my Uncle died leaving stacks of event T-shirts behind. T-shirts are nice and soft so they are fun to work with and they make a great crocheted rug. I found your blog on facebook, so now I guess if I want to post my “how to” for rugs I’ll have to join your ranks. Oh my goodness I literally just made it. It turned out great! What an amazing idea! I love it.I will make it for my little baby. What is a reasonable sale price for this product? This would be a fun summer project for my teenager to earn money. I was thinking the same thing. I’m going for 5 to 10 dollars a bag depending on the size. 1/2 price tshirts at Goodwill. Really like your creativity. I always prefer different type of clothing in my life which attracts people to me and my style. I like fashionable clothes in which I feel comfortable. 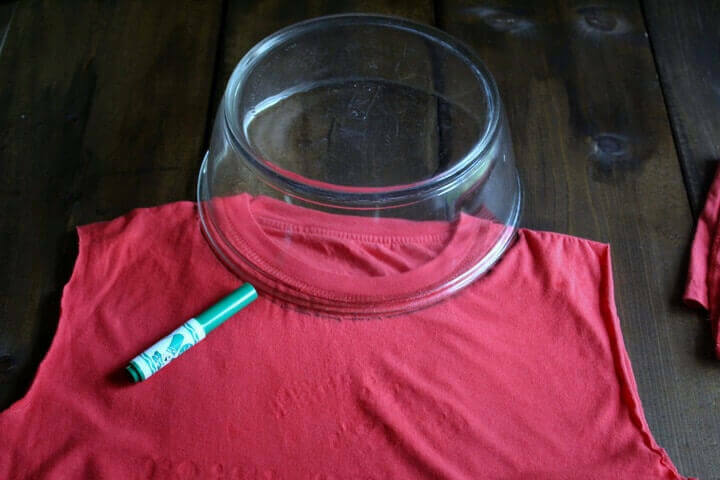 You could also use an old tank top and eliminate the first step. I had a question, would I be able to share this? We use the sleeve arm bands as hair lackies. Just cut again on the “shirt” side of the hem and use that section (about 1.5cm) as a hair tie. 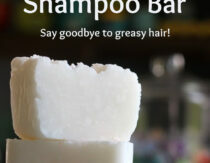 I really enjoyed making mine, but it came apart after I washed it…what did I do wrong? I did the tshirt bag thing and THANK YOU. I have a ton of tshirts I do not want to get rid of but I finally found something that makes other uses out of them. thank you super easy project. This is such a fun idea. We did this at the farmers market I manage at the kids craft table. Everyone loved it. Thank you! What a cute no sew idea! I am always searching for what to do with old t-shirts – we have so many! Wow! I can now do it. I would like to make a shirt and finally I have learned. Thanks for sharing this. Knot the first three sets of strands, then make a knot between the left strand of your second knot with the right strand of the first knot (the one on the end of the bag). Knot the other side of the second strand of knots (the right side) with the left side of your next set of knotted strands (the third set you tied together). Tie your next set of strands together in a knot (set 4) and tie the left side to the right side of knot three, make a new knot with the fifth set of strands and tie the right side of it to set four– keep going all the way along the bottom of the bag. It should only take you about 5 minutes. All you’re doing is connecting (by knotting) each strand of the tied knots with the strand directly beside it. So glad you found the tutorial helpful, Becca! Very cute… But wouldn’t a (French) braid work to close the bottom? No holes, and pretty! I think I’ll go that route! Transforming old shirts and making them a simple tote take note that it will not be sewed needs an art print that are in with the trends nowadays. The knots are for those who like the look or don’t have a sewing machine, or to be simple enough for kids to make their own.